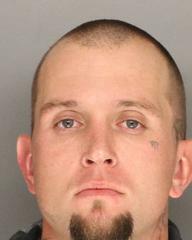 At approximately 2:15 p.m. yesterday, February 25, 2019, members of the AB109 Compliance Response Team (CRT) conducted an investigation into the whereabouts of wanted Post-Release Community Supervision offender, 28-year-old Jacob Dreyer of Carpinteria. Dreyer, a convicted felon, had a no bail warrant for his arrest due to absconding from the terms of his AB109 probation. In the afternoon, CRT members located Dreyer in the 300 block of Mathilda Dr. in the City of Goleta. CRT members attempted to apprehend Dreyer who immediately ran, leading them on a short foot pursuit. CRT members chased Dreyer until he entered an apartment, which was later determined to belong to an acquaintance, where he barricaded himself. A perimeter was established and numerous announcements were made requesting Dreyer to surrender peacefully. An emergency alert was sent to residents in the immediate area advising them to shelter in place. Dreyer remained barricaded and refused to surrender. Detectives, two K9 units and deputies assigned to the Goleta Valley Patrol Station responded to assist. CRT continued to receive no response after repeated announcements and phone calls into the apartment. The front door was breached, Dreyer came out and was taken into custody without further incident. Dreyer was booked into the Santa Barbara County Jail on his no bail warrant. The Compliance Response Team is funded by realignment money distributed through the Community Corrections Partnership, a committee of various county law enforcement and judicial representatives. CRT consists of Santa Barbara County Sheriff’s Deputies and a Probation Officer.